After I published the post called “What About Homework” I got an e-mail from a friend who is a principal in Washington County in southeastern Utah. With his permission, I am posting his e-mail here, with emphasis added where needed. “Very interesting that you should bring up the homework controversy as I read Visible Learning for Teachers by John Hattie (maybe you’re familiar with his work?) and he does list homework in his compilation of research. If you’ve read him, you’ll know that his studies include an estimated 240 million students, but in order to reach “effect sizes” he uses over 161 studies of 100,000 students or more (so his results are quite believable). So… an “effect size” of 0.40 is considered “worthwhile” (whether it’s an intervention or a program, etc.) and anything above 0.40 is even more worthwhile. It’s a very interesting read to see all of our practices and how “effective” his analysis of research shows they are. It’s been fascinating, actually. Ok… that being said… you’d be interested to know how homework rates? In high school the effect size is 0.50…. so it’s worthwhile, actually pretty good. But in elementary…not so good. The effect size is -0.08…. That’s negative 8 hundredths! That means it does more harm than even close to being good. That made me wonder. We haven’t changed much at our school, but we’ve discussed this research including the homework. I just thought I’d pass that along. Thanks, Kelly. That ought to give us something to think about. Back when I was a youngster, lo, these many years ago, homework was the bane of my existence. In fact, I tell people, truthfully, that I only did homework for two classes in high school – Trigonometry and Medieval Literature. That I graduated at all is a miracle. That I got college scholarships is even more of a mystery. Now I believe that homework itself is a mystery. At least in elementary school. How much homework is too much? Should we send homework at all? What kind of work should be homework? Should there be policies regarding homework in elementary schools? See what I mean? Mysteries. When I talked with the LEA (Local Education Agency – that is fancy talk for school districts and charter schools) mathematics supervisors a few months ago it became clear that most LEAs haven’t thought a lot about homework policies or practices for quite a while. The same article quotes Alfie Kohn, the author of The Homework Myth, as saying “The fact that there isn’t anything close to unanimity among experts belies the widespread assumption that homework helps.” Mr. Kohn believes strongly that schools should never assign homework. Assign purposeful homework. Legitimate purposes for homework include practicing a skill or process that students can do independently but not fluently, elaborating on information that has been addressed in class to deepen students’ knowledge, and providing opportunities for students to explore topics of their own interest. Teachers should never assign homework that introduces a new skill or asks students to practice concepts they still find difficult to understand. Involve parents in appropriate ways (for example, as a sounding board to help students summarize what they learned from the homework) without requiring parents to act as teachers or to police students’ homework completion. If parents feel they must teach their children a concept the homework, at least in the younger grades, is probably not appropriate. Carefully monitor the amount of homework assigned so that it is appropriate to students’ age levels and does not take too much time away from other home activities. The authors note that many research studies recommend the “10 minutes times the grade” rule. In other words, in first grade all homework combined should not take more than 10 minutes per night. In second grade the time allowed could raise to 20 minutes, and so on. However, the studies also note that positive effects of homework in junior high top out at 90 minutes. More time spent on homework over that time limit actually had a negative effect on achievement. In high school the limit seems to be 1 1/2 to 2 hours a night, depending on the study. The point here is that elementary teachers should be very careful with what they assign as homework and with how much homework they assign. 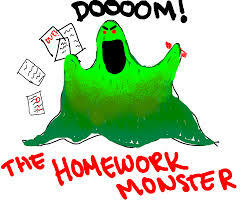 Parents should be made aware of the purpose of the homework assignments, the length of time the student should spend, and what the expectations are. Parents should feel free to call a halt to homework assignments if their child is getting frustrated, spending an inordinate amount of time on homework, or obviously doesn’t understand what to do. Sending a note or an e-mail to the teacher is entirely appropriate in those cases and teachers should respond positively. Ms. Sorensen was using her iPad and Educreations to teach long division with decimals. Her iPad was connected to the projector and she was not only recording her voice but was using the iPad as a kind of smart board. She was writing on the iPad as she taught. She also recorded student comments, their answers to questions, and so on. Mr. Pugmire, the principal, was standing right next to me and told me she would post that lesson on her blog that night so students could refer back to it, so that those who missed class could see and hear what happened, and so that parents could understand what their students were doing and help them with their homework. It was a good thing, too, because she was teaching division with decimals in a mathematically correct and conceptual way, very different from how most of us were taught. Instead of just telling the students to move the decimal point she emphasized that they were changing the place value of the digits in both the divisor and the dividend by multiplying them by a power of ten. She stressed that they could have done the problem without changing the place value, but doing so made the problem easier to do because they didn’t have to worry about keeping track of the decimal point. They were also able to preserve place value, which doesn’t often happen in long division. Other teachers in Cache record short messages for parents and/or students about what they taught that day and how they taught it. Such messages can help parents understand the strategies and teaching methods they use to help students understand concepts. Other teachers I have talked to record a short video on their smart phone at the end of the day and explain the homework for that night. They post that on their website and parents know to check for it. Others simply send an e-mail message. Others direct the parents to websites such as LearnZillion that have short videos made by master teachers explaining mathematical concepts. Jordan District, for example, has linked both the Utah Core Standards and their textbook to LearnZillion videos. Many textbook publishers also have websites for parents that can help. Contact your LEA to see if their adopted textbook has such a site. So, to recap. The research isn’t clear about whether homework in the elementary grades has any correlation to student achievement. One researcher, Duke University Professor Harris Cooper, found that for elementary school students, “the average correlation between time spent on homework and achievement … hovered around zero.” So some elementary schools are eliminating homework other than nightly reading and citing research to do so. Still, it is hard in an era of “raise the bar” academic standards to think about forgoing homework altogether. Those elementary schools that do give homework should think very carefully about the recommendations given above. It is hard to justify homework outside of the given recommendations. By the way, I am not endorsing Educreations. There are other apps like Doceri and Explain Everything that do the same thing. They are called interactive white board or screencasting apps. Happy mathematics learning to all! http://www.gse.harvard.edu/news-impact/2012/01/are-you-down-with-or-done-with-homework/#ixzz333M9Gvtk Illustration from the same source. Dan Meyer also wrote about his presentation at ASSM in his blog. I’m sure he didn’t develop the whole idea just for us. However, his presentation called “The Future of Textbooks, If There Is a Future for Textbooks” was really thought provoking. 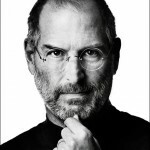 Taking digital textbooks out of airplane mode was his main theme. If they don’t do anything a smartphone in airplane mode would do, if they don’t connect to anything else, then they are just a textbook. Accessed at http://www.pinterest.com/pin/200339883394174796/. No, I don’t have a pinterest account. That is just where Google took me. Really. I Googled story problems for a reason. I went to see a new doctor this morning because my old one either retired or went crazy. I’m not sure which. You know that new doctors ask a lot of questions. One she asked me was what I do for a living. Now, that is a loaded question. Normally when I tell people that I am the Elementary Mathematics Specialist at the Utah State Office of Education I get a lot of unwanted sympathy. “Bummer, man.” – okay, so they would have said that in the 60’s but I’m old enough to remember it. When I tell them I love what I do they can hardly believe it. They look at me really funny when I tell them they should give math a second chance. Another reaction I get is some kind of math story. My new doctor this morning told me hers. She said that she was always really good at math in high school and that was tough. People made fun of her because of her math achievement and especially because she was a girl. That all seemed to be socially unacceptable. But she hung in there and took math all the way through calculus in high school and did very well. Things changed in college, though. This was in the days before AP tests so she had to retake calculus. She thought it would be a breeze because she got A’s in it in high school. No sweat. However, every problem was a story problem! Every one of them! She wasn’t used to that. In high school she just had to do sets of 20 to 40 problems and then, maybe, one story problem. She had no idea how to interpret all these story problems and she was intimidated. So, she talked to her engineer dad. He just laughed and said, “Listen, dear. Life is a story problem.” To an engineer math is for solving problems. I’m sure they have very little use for sets of problems with no connection to reality. Another story – this morning my wife told me she had read my post on Strategies in Addition and Subtraction. She said it made a lot of sense to her. She struggled with math in elementary school until she got a teacher in sixth grade who took a special interest in her and taught her ways of dealing with numbers and operations. She was still put in the low group in seventh grade math but she quickly found out that, because of what her sixth grade teacher taught her, she could figure out what to do pretty easily. She couldn’t understand why other people were having so much trouble with the math. She is sure that her sixth grade teacher taught her some strategies that made sense to her. Even today she does math in her own way and is very, very quick and accurate. What is the moral of this story problem? We have to teach in context, in problem solving situations, in the real world or as close to it as we can get. Dan Meyer in his blog http://blog.mrmeyer.com/ talked about Fake World contexts not long ago. You need to read what he said, but one quote that will stick with me for a long time is “You have to know what your students worship.” Meaning, of course, that in order to really dive into the mathematics and be fully involved with problems students have to want to solve them. The problems have to raise their curiosity and perplex them a little. What a great concept. 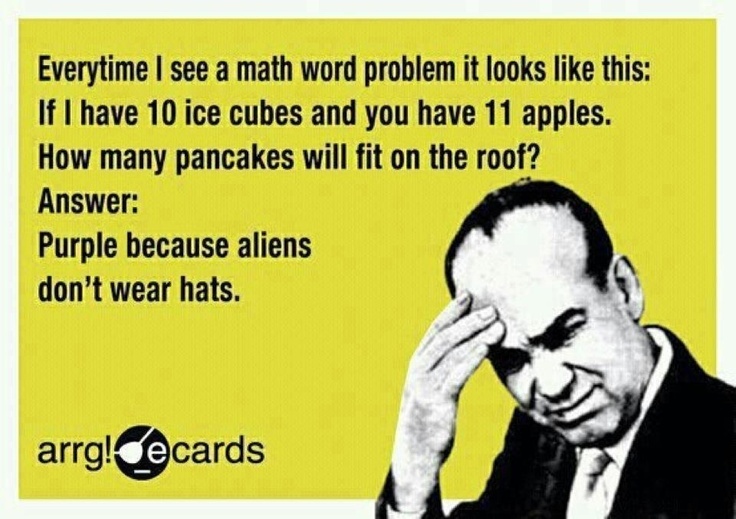 We also have to make sure our students understand the mathematics they are learning. That is vitally important, and it doesn’t matter whether they will be engineers, coders, research scientists, mathematicians on the cutting edge of some obscure but important specialization or just people trying to balance their checkbook. Although, if students understand mathematical concepts and are engaged in math because they really want to solve those story problems, we may actually have more scientists, technologists, engineers, and mathematicians come out of our schools. That would be a great learning outcome. Just a quick note. Yesterday the Utah State Office of Education and the Utah Education Network hosted a Core Academy in Action Math Webinar on Journaling in Mathematics. It was presented by Tamara Shaw, a former math coach and current elementary teacher in the Weber County School District. The webinar was recorded and is now available along with the PowerPoint Tamara used in her presentation. may be aimed at converting one problem into another. when the steps are carried out correctly. When most of us were in school algorithms were the instructional recipe of the day. We were taught the steps for solving addition, subtraction, multiplication, and division problems. Most likely, we were taught them without understanding, meaning that we were just taught the steps and not why they were used or how they worked. That is a main cause of much of the confusion from and dislike of mathematics in general. Unless you have a very logical and organized brain it is difficult to remember all those steps. Now, that is not to say the algorithms are bad. They are not. They are efficient means of solving problems and, as the definition says, you get the correct result every time you follow all the steps correctly. We want students to be fluent in those algorithms. But that fluency comes at the end of an instructional sequence where students use strategies to solve problems before they move to the algorithm. Why do we do that? It leads to better understanding. Let’s explore why. 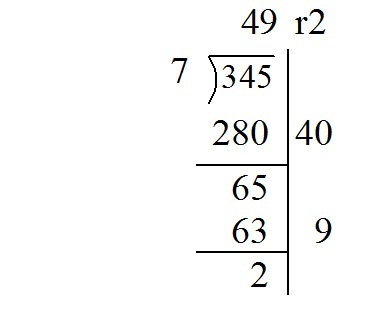 That looks a lot like the standard algorithm, but the computation was done with place value strategies. Another place value strategy for division is called partial quotient division. Take a look at the video on this page to see what it looks like. 465 + 230 is pretty straightforward. 400 + 200 = 600, 60 + 30 = 90, 5 + 0 = 5. So the answer is 695. 526 + 98 = well, it’s easier to add 526 + 100. That is 626. Then I have to take the 2 I added to 98 back off. So the answer is 624. Of course, when students are first exposed to a new concept the strategies they use should include using concrete objects, such as base ten blocks, counters, linking cubes, and so on. Using those manipulatives gives them the opportunity to explore concepts with things they can actually touch and manipulate. Students may then move to the representational phase, which means they will use pictures, diagrams, visual models, and so on to take the place of the concrete objects. 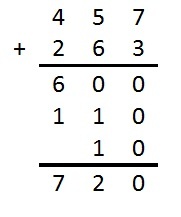 Then they will move to using abstract numbers, like those we have been using above. This is true even when students are learning algebra. I was watching a seventh grade class not long ago working on linear equations. The teacher allowed the students to use whatever strategies they felt comfortable with. None of the students chose to use concrete objects. But some used tables, some used graphs, and others used equations. When the students explained what they had done they were asked to tell how and why they got their answers. Those using equations explained what each part of the equation meant and why they had written it as they did. Then the teacher tied all the strategies together to show how each illustrated the same thing. The point is that students should never use a strategy nor an algorithm unless they can explain what it means, what they did, why they did it, and why they feel their answer is appropriate. I am going to try to write posts in this blog every two weeks rather than once a month. Just so I don’t leave you hanging, next time we will talk about computational strategies for addition and subtraction and how students can learn the standard algorithm as the core requires.